October has been a fun month. I got to travel across the country to three different places, met with amazing people and shared the common enthusiasm about technology. It's like our souls know each others. Code camps are opportunities for learning for everyone; including presenters and attendees. For one, presenters in one session like to go to other sessions as attendees, the other is, when they are asked thought provoking questions covered with practical problems of the individual developers. Most of the times, it makes the presenter think about the specialized area; it makes them see it in a different perspective. Can we add PCL references in Montouch and Mono for Android applications? The short answer is Yes; and we can also do that in Visual Studio. I have Xamarin Starter edition installed on my machine. It also includes a trial version of Visual Studio extension for Xamarin tools. 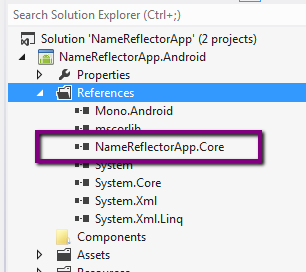 Here I have a sample solution called NameReflectorApp. It has a portable class library project Xamarin.Core. 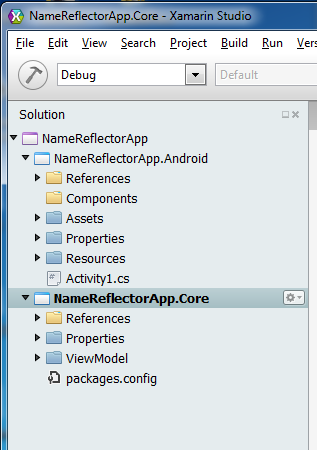 It also has an android application project NameReflectorApp.Android. 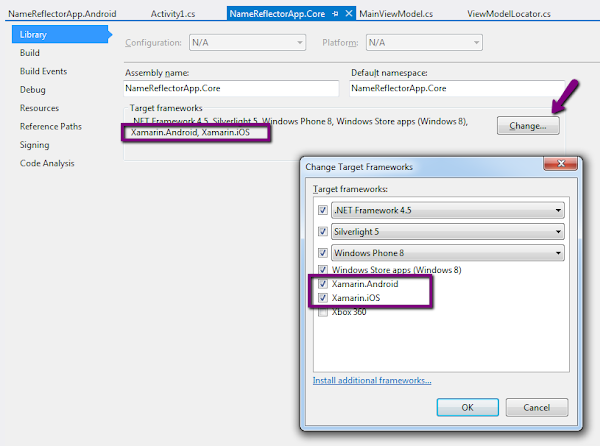 Xamarin has support for Visual Studio. But this is not available for all the editions. Generally speaking, it is available for more expensive ones. But we can still play with the extension during the trial period available when we install the starter edition. The best thing is we can decide when we want to start the trial period. We can use this option to first familiarize ourselves with the technology and when we need to see how well it integrates with our current Microsoft technologies, we can start the trial period. Visual Studio is not as forgiving in adding references in such case. There are issues with the Xamarin's Visual Studio extension. 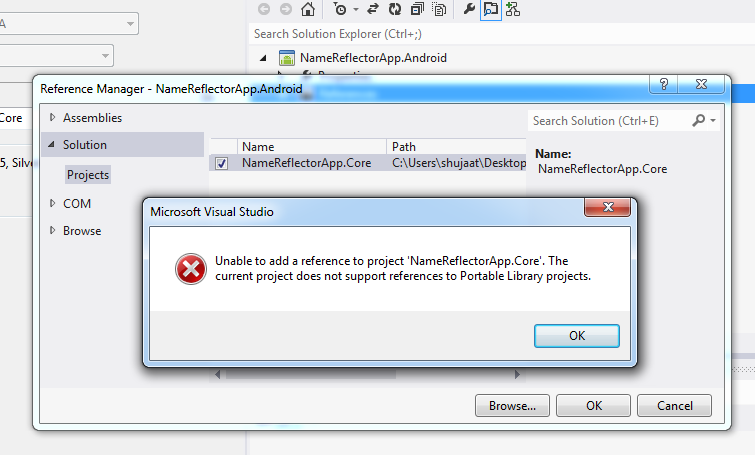 As we add our portable class library's reference to Android application, it shows up the following error dialog. Xamarin developer community terms this situation as a lie. In order to fix this, we need to use some xml hack. 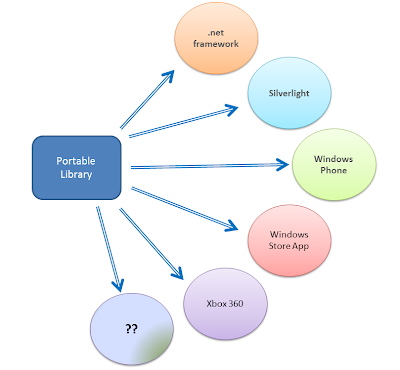 I would totally recommend the following post where we discussed how we can add additional frameworks options for Portable Class Library projects. After adding the above files, we need to restart Visual Studio. After that, as we go to the PCL's property page, we see that there are already Xamarin.iOS and Xamarin.Android in the target framework list. If we hit Change button, we see additional options for Xamrin.iOS and Xamarin.Android. These options are checked. Adding the reference to the Android application project goes through just fine. Here is the portable library's reference added to the project's references list. If you have Xamarin Studio running then restart this and open the same solution again. You can see that these new frameworks are also available in Xamarin, which is amazing.